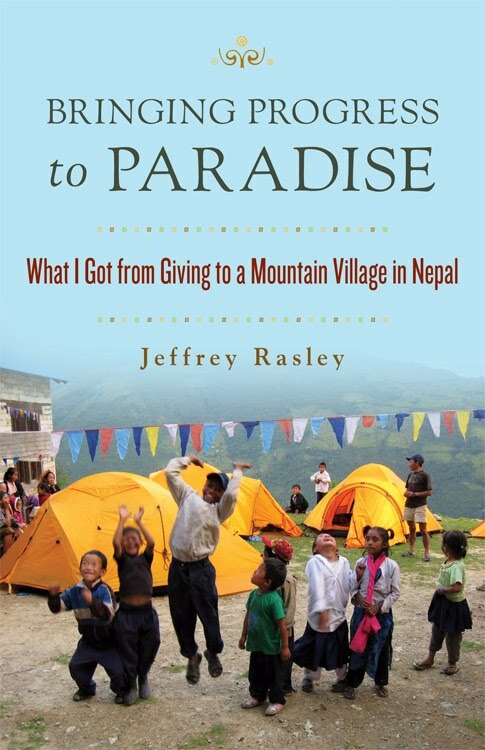 Author and Himalayan Mountains expedition organizer Jeffrey Rasley is one of America's foremost experts on Nepal. Since I'm getting ready for my third trip to that country, I was happy to find out he's releasing his second book about the country, Bringing Progress To Paradise. I was even happier when he agreed to do a guest post for the blog. In the 1980s and ’90s, the trekking-tourist industry grew rapidly. Many Nepalese were lifted out of poverty in the tourist destination areas such as the Katmandu Valley, the Khumbu along the Base Camp Trail, Langtang, Pokhara, and around the Annapurna Circuit Trail. But the boom was short-lived and busted by the end of the ’90s. The 2003 Jubilee celebrations caused an uptick, but the truce between the government and the Maoist rebels ended after the celebrations, and the return to violence again scared off the tourists, particularly Americans, because President Bush declared the Maoists an international terrorist organization. In October 2004, while I was mucking around in Tribhuvan International Airport dealing with lost bags, friend Elliot was waiting for me outside the airport when he saw an explosion in downtown Katmandu. The Maoists had rolled three hand grenades into an office building. That was the closest anyone in my trekking groups came to experiencing violence or being directly affected by the civil war in Nepal. But fear of violence and the political instability of Nepal frightened some friends away from joining my expeditions. Beginning in the late 1990s, the Maoists claimed territorial rights over certain trekking trails. These trekking trails became revenue sources for the Maoists. Armed bands would block trails and require trekkers to pay a fee to use the trail. The leader of the band would give the trekkers a lecture about politics in Nepal and then issue each trekker a certificate declaring the fee had been paid so other Maoist bands would not collect the fee a second time. If a trekker didn’t have enough money to pay the fee, the Maoists would take a camera, climbing gear, down jackets, or other valuable possessions. The fee was generally around $100, but after the U.S. government declared the Maoists international terrorists, Americans were required to pay double the amount of all other nationals. When the Maoist insurgency was at its worst, I wrote “Canada” on my trekking duffel with a Sharpie, just in case. The Maoists were unsuccessful in penetrating Sherpa communities in the Khumbu, so, happily, I never had an encounter with one of their armed bands. Every Westerner I met in Nepal who hiked the Annapurna Circuit from the mid-90s through 2006 had a Maoist encounter. In the Khumbu, what we encountered was an ever-increasing military presence. Each year, we passed more government soldiers on the trails and had to cross through additional military checkpoints. In Katmandu, the king would periodically impose a curfew on citizens, which usually didn’t apply to tourists. Walking back to our hotel in 2004 after a night out with Nepalese friends, Briggie, Elliot, and I had to endure the hard stares of young soldiers with loaded carbines. They were understandably resentful that we were allowed to walk the streets of Katmandu freely, while our Nepalese friends had to skulk down alleys and hide from the soldiers, or risk arrest or a beating. Most of the army recruits during the civil war were young uneducated village boys. Their training was poor, evidenced by the fact that they lost most of the pitched battles against the Maoists, and the allegiance of the Nepalese people eroded and eventually swung in favor of the Maoists. So it sent a little shiver down my spine when that young soldier stepped out in front of us, pointing his rifle at us, while intently eyeballing Briggie, a tall, slim, blond, blue-eyed South African. But with a sneer and jerk of his head, he let us pass. I have never been the victim or even seen any real violence in Nepal, but what I did experience was amazement and disbelief at the change in the Nepalese attitude toward violence as the Maoist Rebellion became a full-fledged civil war. Just before my first visit to Nepal in 1995, a Nepalese guy killed a European in a bar fight in Katmandu. The entire nation was in mourning when we arrived because of the felt national disgrace and sorrow over a guest of Nepal being killed. In the ten-year civil war, from 1996 to 2006, an estimated 12,800 Nepalis died. I found it unbelievable that the Maoists and the government could have brought such a degree of fear, death, and destruction to a nation that mourned so soulfully over the death of one person two years before the war began. In 2006, as the war reached its climax, a friend was brutally beaten in Katmandu. Raaj is a native Nepali, but grew up in India, has long hair, owned a tea shop in Katmandu, and is the leader of a rock band. He looks like a dissident, but he was not a Maoist, just a guy who loves Western rock music. One night when walking home after a gig in Thamel, Raaj and his band mates were jumped and beaten by “royalists.” Raaj’s arm and nose were broken. When I saw him a month or so after the beating, of course I was upset for him, but I also found it hard to accept that such a thing could happen in this country that had been a beacon of peace in a violent world just a few years before. More on Jeffrey's Nepali observations tomorrow.